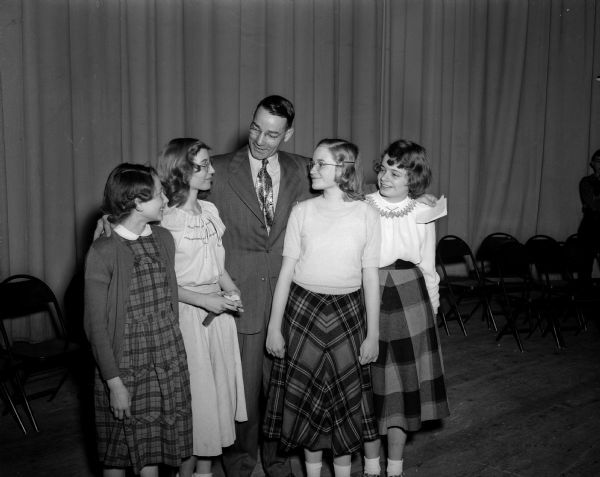 Roger E. Trafford, principal at West junior high school, stands in an auditorium with his students who won the first four places in the school spelling bee. His students, left to right, are Gretchen Idhe, fourth place; Diana DeLess, third place; Virginia Wallace, runner-up; and champion Carol Jane Beery. Published in Wisconsin State Journal April 5, 1950.